Welcome to Michael O'Leary's official fan club of 1. Thanks to Ryanair, in the last 10 years I have been all over Europe, often for less then the price of an onboard coffee. Up to a couple of months ago, before the M6 opened, I could have been and often was, in London, Paris, the South of France or Barcelona quicker then Dublin. Venice, a once in a lifetime trip for most people? been there, done that twice or is it three times? Mind you, I screwed up mightily on that one, being a Ryanair virgin at the time, blatantly ignoring the Ryanair shuttle bus timetable which suggested leaving several hours in advance of departure? Why be a cheapskate I thought? when I could do the diva thing and get a watertaxi from St Marks to the airport in just 15 minutes... wrong airport thats why? it then cost an arm and two legs to get to back to Treviso, okay point taken.....So you might land up in the middle of nowhere? do your homework, decide if you can live with it or do without? The frills? Who needs them? All I want is to get from A-B safely and on time and luckily in over a 100 flights, I have only ever missed one, totally my own fault, never had one cancelled, ash clouds apart. And since having more then one item of cabin luggage became a hanging offence, guess what? you no longer have to stand in the aisle forever, while some eejit tries to squish everything bar the kitchen sink into the overhead lockers, okay that was me in another life, but not anymore. The bag thing, I have that down to a fine art, I can now pack what I need for a month into a lunchbox. I am going on holidays for Gods sake, not the catwalk! If I want to do the shopping thing I can either book a bag or Selfridges, Galeries Lafayette, El Corte Ingles and Coin please take note, I will clear the rails if you can ship my purchases home at a reasonable cost? Personally, I cant wait till I can hop on a .99cent flight to the States, for that money I’ll even stand or not pee, he’s joking by the way....That’s what he does best stir things to get attention. But it gets the job done, he doesn’t stand for any nonsense and if he was running the country we would probably be out of the recession by Christmas. He’s the Irishman everybody loves to hate especially in Ireland but then that’s a particularly Irish trait, knock anybody who gets off their backside and gets on with it. That’s his attitude and he’s right nobody owes you a living, you have got to make your own, how's that for grounding froma an airline boss. 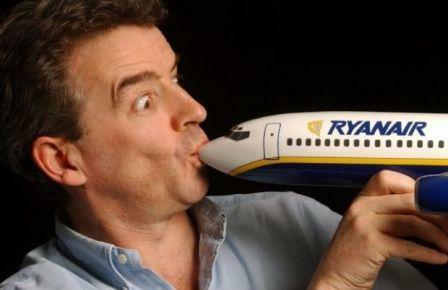 PS its been suggested that we name the new Terminal 2 after Michael O'Leary and pay him €5 for every tourist he brings into the country, nice one, I'll second that!